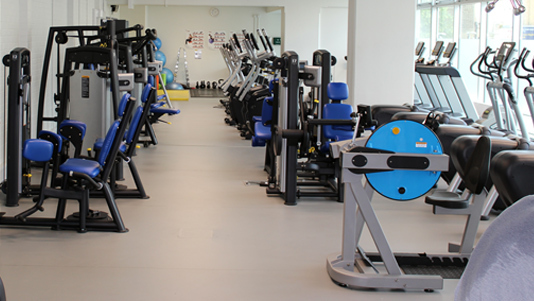 The Academy of Sport at LSBU is proud to house a wide range of facilities and equipment. Take a tour of the Academy of Sport. Our changing rooms have everything you need including showers, lockers and hair driers. The Academy provides accessible facilities and has 'Registered' status in the Inclusive Fitness Initative (IFI) programme. We continuously work with the English Federation of Disability Sport (EFDS) to ensure disabled people can enjoy the benefits of physical activity. Our Functional Training Zone (FT zone) is dedicated to suspension training, a form of resistance training that uses body weight for exercises which develop physical strength by using functional movements and dynamic positions. The FTzone is only accessible during classes and free time sessions, as specified on the class timetable (PDF File 610 KB). The Functional Training Zone is available to hire for £50.00 per hour. Our dedicated free weights training room is ideal if you're taking your strength and conditioning training to an extra level. Our Sports Hall is suitable for a range of activities including five-a-side football, tennis, badminton and basketball. It is the Sport England recommended size of 33m x 18m and is equipped with three ring areas for Taekwondo. It hosted the French Olympic Judo and Wrestling teams while they trained in the final weeks leading up to the London 2012 Olympic Games. The Sports Hall can also be block booked at £84.00 per hour.This cost is reflective of bookings over a seven day period and maybe subject to VAT.